This wonderful trilobite was found last month by Olivia Brown (’15), a student on the Wooster Geology Department’s glorious field trip to the Mojave Desert. Olivia collected it at Emigrant Pass in the Nopah Range of Inyo County, southeastern California. It comes from the Pyramid Shale Member of the Carrara Formation and is uppermost Lower Cambrian. It appears to be the species Olenellus terminatus Palmer, 1998. It is a great specimen because most of the body segments are still in place. At this locality we find mostly the semi-circular cephalon (the head) separated from the rest of the body. The species O. terminatus is so named because it represents the last of its famous lineage of Early Cambrian trilobites. The last time we found such a whole trilobite at this site was in 2011, with Nick Fedorchuk as the paleo star of the day. This trilobite has been tectonically strained along its main axis, giving it a narrow look it did not possess in life. In fact, these trilobites with their semi-circular cephala make nice indicators of the strain their hosting rocks have experienced. 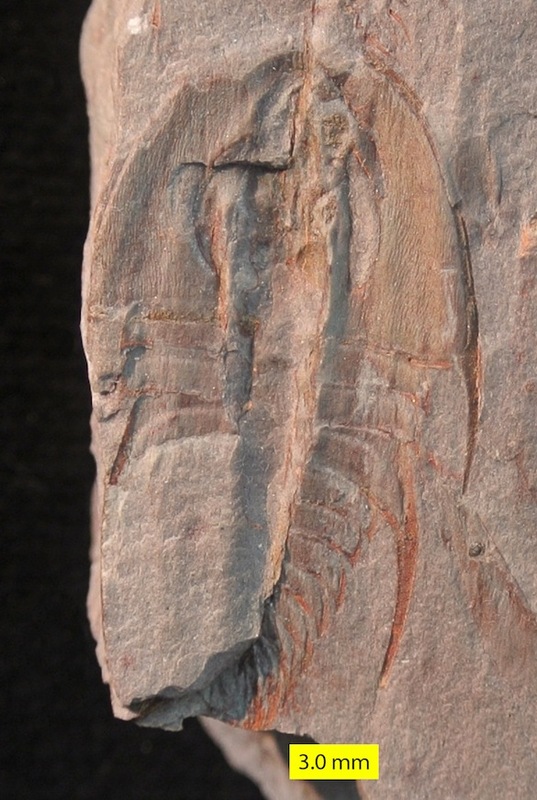 This particular kind of trilobite has very distinctive spines, as shown in the close-up above. The long spine on the right comes from the trailing edge of the cephalon and is called a genal spine. The one in the center is a thoracic spine emerging from the third thoracic segment. The primary role of these spines was probably the obvious one: protection from predators. They may also have helped spread the weight of the animal across the substrate if they were walking across soupy mud (much like a snowshoe). We’ve met this man before in this blog. 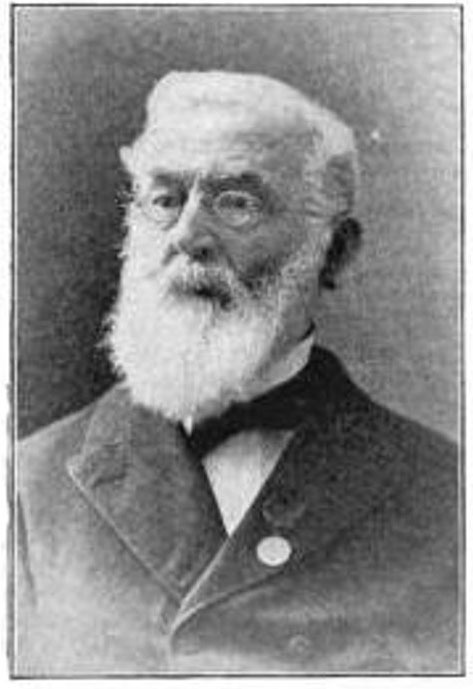 James Hall (1811–1898) named the genus Olenellus in 1861. He was a legendary geologist, and the most prominent paleontologist of his time. He became the first state paleontologist of New York in 1841, and in 1893 he was appointed the New York state geologist. His most impressive legacy is the large number of fossil taxa he named and described, most in his Palaeontology of New York series. James Hall is in my academic heritage. His advisor was Amos Eaton (1776-1842), an American who learned his geology from Benjamin Silliman (1779-1864) at Yale. One of James Hall’s students was Charles Schuchert (1856-1942), a prominent invertebrate paleontologist. Schuchert had a student named Carl Owen Dunbar (1891-1979). Schuchert and Dunbar were coauthors of a famous geology textbook. Dunbar had a student at Yale named William B.N. Berry (1931-2011), my doctoral advisor. Thus my academic link to old man Hall above. Adams, R.D. 1995. Sequence-stratigraphy of Early-Middle Cambrian grand cycles in the Carrara Formation, southwest Basin and Range, California and Nevada, p. 277-328. In: Sequence Stratigraphy and Depositional Response to Eustatic, Tectonic and Climatic Forcing. Springer Netherlands. Cooper, R.A. 1990. Interpretation of tectonically deformed fossils. New Zealand Journal of Geology and Geophysics 33: 321-332. Hazzard, J.C. 1937. Paleozoic section in the Nopah and Resting Springs Mountains, Inyo County, California. California Journal of Mines and Geology 33: 273-339. Palmer, A.R. 1998. Terminal Early Cambrian extinction of the Olenellina: Documentation from the Pioche Formation, Nevada. Journal of Paleontology 72: 650–672. Palmer, A.R. and Halley, R.B. 1979. Physical stratigraphy and trilobite biostratigraphy of the Carrara Formation (Lower and middle Cambrian) in the southern Great Basin. U.S. Geological Survey Professional Paper 1047: 1-131. Shah, J., Srivastava, D.C., Rastogi, V., Ghosh, R. and Pal, A. 2010. Strain estimation from single forms of distorted fossils—A computer graphics and MATLAB approach. Journal of the Geological Society of India 75: 89-97.